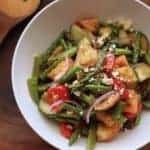 Panzanella Vegetable Salad is delicious, easy, and healthy. 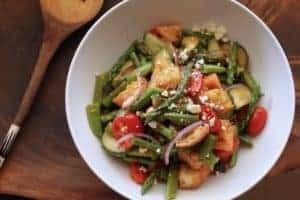 A sensational summer salad right down to the last chewy bread bite! The sun is high. The blossoms are buzzing with bees. The grass is going crazy. With all the yard work and outdoor doings, an easy, simple dinner is what I’m looking for. Found it. Panzanella is an Italian tomato-bread salad. Before you hang up on me, it’s better than it sounds. The bread absorbs the dressing, becoming lovely chewy bites, not a mushy, soggy mess. You’ll likely be picking out any leftover bread cubes. This recipe was based on economy. Years ago, bread was usually baked once a week. To refresh it, people would soak the loaf in water or oil and vinegar for a few minutes to moisten it, making it edible. Using what was in the garden, thrifty cooks repurposed the bread into a salad. Panzanella. Check out more ways to use leftover bread here. Bread is a costar in this salad so a firm loaf is required. Sourdough, ciabatta, French or Italian are best choices. Tomatoes are the other star. Fresh from the vine are what we dream about. But smaller grape or cherry fill the gap if you can’t step out your door and pluck tomatoes from your garden. The thing about this recipe is that it is flexible. Save a trip to the store and use what you have on hand. 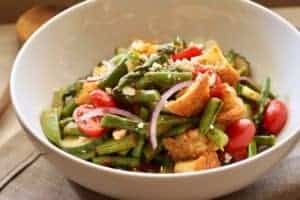 Here, I’ve focused on some spring vegetables, but you can substitute your favorites such as cucumber, artichokes, avocado, red peppers, green onion, arugula, or olives. I’ve tossed the salad with roasted tomato vinaigrette. Feel free to substitute another oil and vinegar dressing. If mozzarella doesn’t suit you or it’s not in the fridge, try goat cheese, feta, Parmesan or buratta. Or omit the cheese. If you don’t have stale bread, no problem, just toast the fresh bread a few minutes longer. A salad bowl that can go in the dishwasher is my preference because is removes all the oil from the vinaigrette. White bowls show off the food beautifully. The salad tongs in the photo above, were a souvenir from Africa. Here is a similar set with the cool handle. With all the variations and options, the thing that doesn’t change is the deliciousness of this hearty salad! 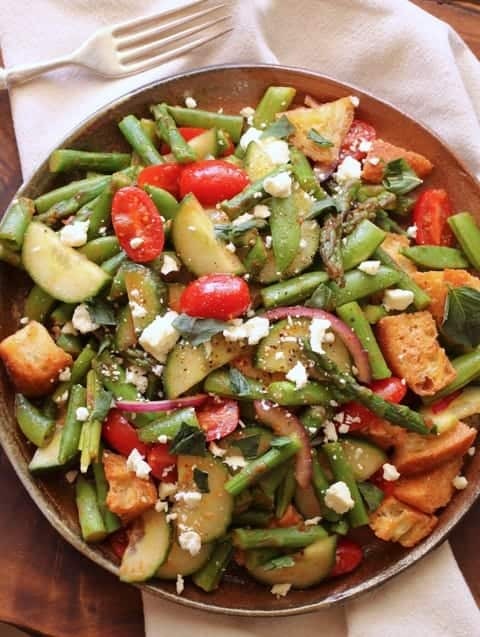 Panzanella Vegetable Salad is delicious, easy, and healthy. 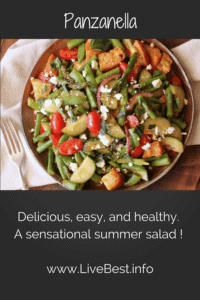 A sensational summer salad! In a food processor or blender, pour in all ingredients. Blend until smooth. Freeze the remaining tomatoes and juice in a jar or air-tight container for another batch of vinaigrette or use in soups or stews. To make bread cubes, pour 1 tablespoon oil in a large skillet over medium heat. Add bread, stirring until all sides are toasted. Cook 15 minutes, stirring every 5 minutes, until bread is toasted. Remove from heat to cool. Cook asparagus in microwave in a glass covered bowl with 1 tablespoon water for 3 minutes on HIGH. Remove lid, drain. Combine vegetables, bread and cheese. Tear basil leaves into large pieces. Start with 1/3 cup dressing, gently toss with salad ingredients. If it seems dry, add another tablespoon or two. Allow salad to sit up to 30 minutes before serving to allow bread to absorb vinaigrette. This Roasted Tomato Vinaigrette recipe makes more than you’ll need for the salad. 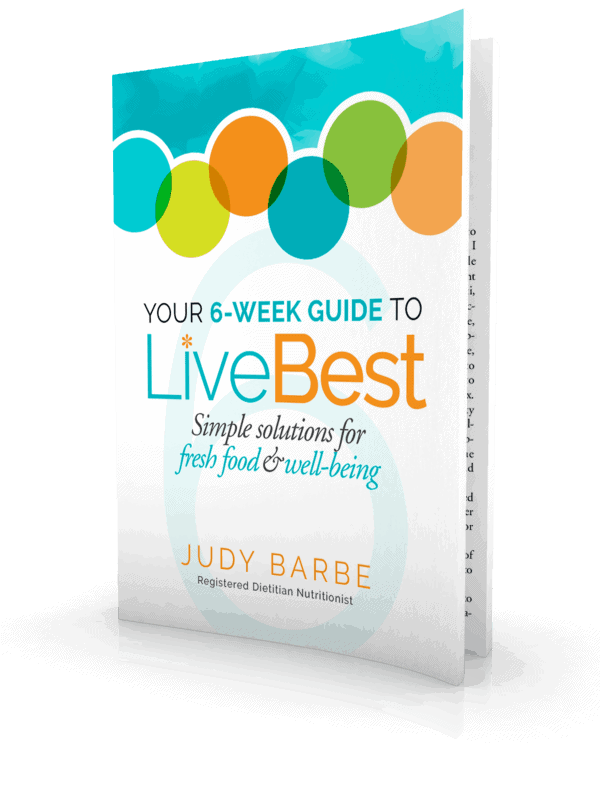 Use it on other salads or drizzle on cooked chicken or fish. The calories are an estimate. Some (about half) of the Roasted Tomato Vinaigrette is factored in, but you shouldn’t need all the vinaigrette in this recipe. ‘Course, if you use more dressing, the calories will increase.